Built with long-lasting enjoyment and convenience in mind, our chairis portable and lightweight enough to bring anywhere yet durable enough towithstand frequent use. It has durablepowder-coated steel frame and high quality fade resistant webbing. Whetheryou set this chair up by the sea or by the backyard pool, it brings a brightnautical nod to any setting. 【Lightweight Webbing】The beach chair is made with high quality fade resistant webbing. The webbing is lightweight, durable, soft and comfortable. It could provide you good seat feeling. 【Solid Structure】The rack of this lawn chair is made by solid pipe construction with heavy-duty material for extended durability, and the structure follows the scientific principle and is strong enough to hold various things. It's sturdy and solid for long time and durable usage. 【Easy to set up】 The foldable design allows you to use this folding beach chair immediately when you open this folding one without the hassle of assembly. It is easy to set up and no tools required. This product has straight forward illustrations and descriptions. Every screw and pin has its own code and it's easy to understand the assemble progress. It won't take you much time and could save your energy. 【Easy to Store and Carry】This chair is lightweight and can be folded into small and convenient travel size. You can store it at home or take it in the car trunk for camping. Wide use: Weather-resistant materials make it particularly well-suited for outdoor concerts, festivals, the beach and parks. 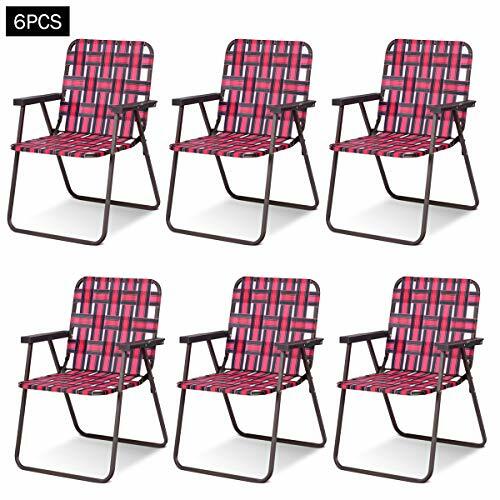 6 chairs is enough for your whole family. 【Perfect Detail Workmanship】High quality iron wire and web connecting procedure which could make this cage more durable and solid. And the structure follows the scientific principle and is strong enough to hold cats to play.